Bangkok can be tricky for vegans. Our tasty guide will help you find the best food! This post will help you find the best Bangkok vegan food. We recommend our favourite vegan restaurants in Bangkok and also share our tips for making your own animal-friendly discoveries. Enjoy! What’s in our guide to vegan Bangkok? Though there are lots of vegan restaurants in Bangkok, I wouldn’t say the Bangkok vegan scene is that easy to navigate, especially if you’re a tourist. For a start, finding vegetarian street food in Bangkok is pretty tough, and vegan street food is even more scarce. Most street food stalls specialize in one or two dishes that are almost always heavy on the meat, light on veggies. The big exception is mango sticky rice, which is fairly easy to find on the street, and deliciously, decadently vegan. The next big problem in Bangkok is getting around. It can take hours, and all your energy, to just go a few kilometres. So unless you happen to be staying near to the best vegan restaurants, it can be a major journey just to get fed. Finally, most of the vegan restaurants in Bangkok are aimed at affluent Thai people or expats, meaning that finding cheap vegan food in Bangkok is especially difficult. Because of the size of the city and the traffic, where you eat in Bangkok will naturally be constrained by where you stay. For example, we ate several times at a pasta restaurant called Lido because it was across from our hotel. It was very good food but unless you’re staying in Silom, the hassle of getting there far outweighs the reward – especially since you can probably find an Italian restaurant near your hotel that will be just as good! So, for this guide, instead of sharing a long list of restaurants that might take you half the day to get to, we’ve shared a few that are definitely worth the trip – plus some tips on finding Bangkok vegan food near your hotel. 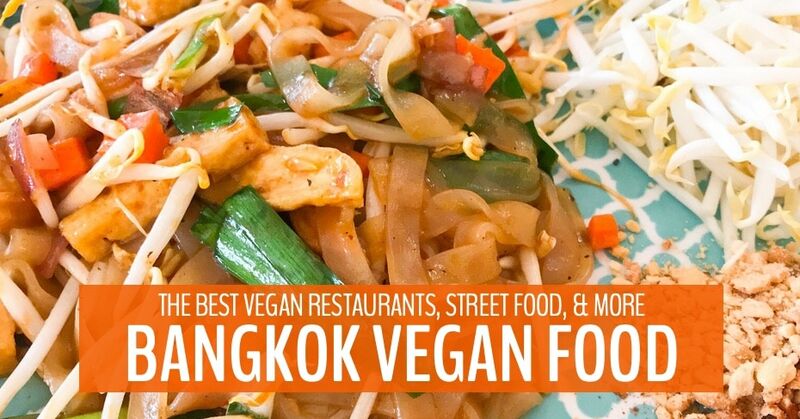 Before you leave this post, grab your free printable guide to Vegan Bangkok. It includes a map and the addresses of all the places I mention in this post! We ate all the vegan noodle bowls at Mill. This one was a tasty mushroom bowl. The vegan sesame noodle bowl was our favourite dish in all of Bangkok. Our favourite vegan food in Bangkok. After many “just OK” meals in Bangkok, we finally found a place that ticked all the boxes. Flavourful food? Tick! Excellent dining experience? Tick! Great price? Tick! There are so many things that make Mill Noodles stand out. First, they provide a rare opportunity for vegans to eat street food without worrying about hidden animal bits. Second, watching the staff at work pulling and kneading the dough until it magically becomes noodles is a treat all in itself. Third, the bowls of noodles topped with mushrooms, peanut sauce, and other tasty options, were incredibly delicious — with the kind of complex flavours you’d expect from a fancy overpriced restaurant. Finally, the big mugs of fermented rice wine they serve with the noodles makes everything just a little more shiny in the world. By the way, they also offer a gluten-free option using Thai rice noodles. We ate: Hand-pulled noodles tossed with sesame sauce, hand-pulled noodles with mushrooms, and all the other options! So so so delicious. For dessert, we got mango sticky rice from the nearby stall, which was also very good. Broccoli Revolution is a modern vegan cafe popular with affluent ex-pats. The mushroom stir-fry at Broccoli Revolution was very tasty. If you’re looking for a bright and modern Western-style vegan cafe in Bangkok, Broccoli Revolution is a great choice. They offer fresh juices, smoothies, smoothie bowls, sandwiches, pastas, and some Thai and Vietnamese dishes. Each time we ate there — unlike most of Bangkok’s restaurants — it was full of tourists and expats. Even so, the food was very good, if not cheap. We ate: Two unusual Thai dishes. Jane’s was stir-fried mushrooms with black rice, Stephen’s was a bowl of spicy flat rice noodles with tofu and puffed TVP, both very filling and satisfying. We enjoyed the Pad Thai at May Veggie Home but it was nothing special. If you’re looking for a good selection of Thai favourites at a reasonable price, May Veggie will satisfy your cravings. It is a very popular veggie restaurant, both with tourists and locals, possibly because of its central location. While it was nice to have a chance to try out traditional Thai dishes knowing they’d be veggie, nothing on the menu was that exciting. Also, as with most Thai food, the servings were very small, so you might need to order three dishes between two people. We ate: Pad thai, which was totally fine — but just not as delicious as many Pad Thais we’ve had in Thailand. The food at Veganerie is good — but not as great as we were expecting. When you’re craving a huge chocolate waffle with ice cream and vegan whipped cream, there is only one place to go in Bangkok. What started out as one shopping mall food court stall a few years ago has now blossomed into four locations around the city. If you want to go for a romantic meal or celebratory dinner, head to the Veganerie Concept location on the edge of Queen’s Park — the only one that’s not in a shopping mall. As with much of the vegan food in Bangkok, we felt that the food was good but not as great as we’d like it to be. Even the waffles were lacking that special something that makes food to-die-for delicious. We ate: Papaya salad with fried not-chicken pieces, waffles, ice cream, and brownies for dessert. As with almost any big city, you can always rely on Indian restaurants in Bangkok to satisfy your vegan hunger pangs. Chances are, you’ll be able to find a good one near your accommodation. If you want the best selection, head to Little India which features an alleyway dedicated to veg and pure veg Indian restaurants (i.e., vegetarian and vegan Indian restaurants). These restaurants cater mostly to Bangkok’s Indian population, so it’s also the place to go for cheap Indian food — these are not tourist prices! Though it doesn’t look like much from the outside and is not the most popular restaurant on the street, we decided to eat at Guptaji Ki Kitchen. The only option here is a thali plate made up of whatever curries they’ve made that day. The great part is, they keep coming back to give you more dhal, rice, chapati, and curries — it really is all you can eat for only 100 Baht (3 USD). Plus the food was very good (just like the Indian food we ate in South India) and the staff were friendly and efficient. They encouraged us to eat seconds, thirds, and fourths — and seemed genuinely worried when I said “no more”. We ate: The thali plate — specify that you’re vegan and they’ll bring you the bread and curries without dairy. It might not look that exciting but this cashew stir-fry at Eathai was amazing. The wide vegan noodle rolls at Eathai were also very good. If you want street food but just can’t be bothered trying to navigate the meaty world of an actual Thai street market (only to end up picking tiny shrimp and bits of pork out of your meal) then head to a food court. Many shopping mall food courts have at least one vegetarian and/or vegan stall, plus you can usually find mango sticky rice, weird Thai desserts made with taro, or classic stir-fried veggies and noodles. In the Central Embassy Mall basement, you’ll find Eathai, probably the best food court in Bangkok. It’s an upscale concept which offers dozens of stalls of traditional Thai street food, but in a clean and air-conditioned environment. The vegetarian stall is called Kun Churn and it has a good selection of unusual Thai dishes made animal-friendly. There is also a branch of Kun Churn in the upstairs food court at Terminal 21, where the food is a little cheaper and not quite as good. We ate: Fried cashews and tofu which was absolutely delicious, wide noodles with mushrooms, also delicious. A pomelo salad which was an interesting gustatory experience, though I’m not sure I’d rush to have it again. Depending on where you stay in Bangkok, you can usually find nearby restaurants that will cater to your vegan needs. Since it’s pretty hard to get around the city, we recommend visiting a few of the closest and finding out if they can make vegan food for you. First, open the app and choose restaurants nearby. Choose a restaurant that you think might have potential. Open the reviews for that restaurant. Use the search function at the top of the reviews section to search for “vegan” or “vegetarian”. You can use TripAdvisor to find out if nearby restaurants have vegan options. Once you’ve done that, you’ll either see reviews that say “this place is great for vegetarians”, “not much for vegans”, or something along those lines. This is the best way to find out if restaurants actually have animal-friendly options.Once you’ve done that, you’ll either see reviews that say “this place is great for vegetarians”, “not much for vegans”, or something along those lines. This is the best way to find out if restaurants actually have animal-friendly options. Another great option if you just can’t face another long journey into the hot and crazy city is to let technology come to the rescue. Because it’s a nightmare to get around, Bangkok has a thriving food delivery industry. Broccoli Revolution and Veganerie are both available via FoodPanda. LineMan is also popular, while HonestBee focusses on delivering healthy and organic meals. If you want to bring your Thai food adventures home with you, there’s no better way than by learning to cook. We joined a Thai cooking class while we were in Bangkok and were happy to find that the instructor totally understood our vegan needs. Our vegan Thai cooking class started with a visit to the local market. She customized each of the menu items for us and even gave us some bottles of vegan sauces to take home! Read our full cooking class review. If you can, it’s best to stay near a BTS station (not an MTR station) which makes getting around Bangkok much less of a nightmare than it otherwise might be. If you need a little extra space, book a suite at Volve Hotel Bangkok. If you’re looking for a gorgeous boutique design hotel near Broccoli Revolution, Mill Noodles, and the BTS, we can highly recommend Volve Hotel. It is incredibly comfortable, walking distance to lots of restaurants and bars, and just a beautiful place to stay. Plus, they have delicious vegan options on their breakfast menu! It was perfect for us and we’d love to go back. We hope this guide to Bangkok vegan food helps you find some excellent meals while in the city. Though we wouldn’t say the Bangkok vegan scene is mind-blowing, it is growing, so let us know if you discover any new gems. Pin this for your Bangkok adventure. Pingback: Should You Go on a Bangkok Bike Tour? We Take to the Road to Find Out! | My Five Acres. Travel. Adventure. Yoga. Pingback: Bangkok Sticker Shock | My Five Acres. Travel. Adventure. Yoga.